Is Oxidative Stress related to Autism? Autism is a disorder of neural development characterized by impaired social interaction and verbal and non-verbal communication, and by restricted, repetitive or stereotyped behavior. The diagnostic criteria require that symptoms become apparent before a child is three years old. Autism affects information processing in the brain by altering how nerve cells and their synapses connect and organize. It is one of three recognized disorders in the autism spectrum (ASDs), the other two being Asperger sindrome and Pervasive developmental disorder. Oxidative stress and abnormal DNA methylation have been implicated in the pathophysiology of autism. Oxidative protein/DNA damage and DNA hypomethylation (epigenetic alteration) were found in autistic children but not paired siblings or controls. Cellular methylation capacity expressed as the mean ratio of the methyl donor S-adenosylmethionine (SAM) to the methylation inhibitor, S-adenosylhomocysteine (SAM/SAH ratio), was significantly reduced in many children with autism. A decrease in the SAM/SAH ratio has been associated with hypomethylation of DNA, RNA, proteins, phospholipids and neurotransmitters with functional consequences in terms of gene expression, protein expression, membrane phospholipid composition and dopamine synthesis. 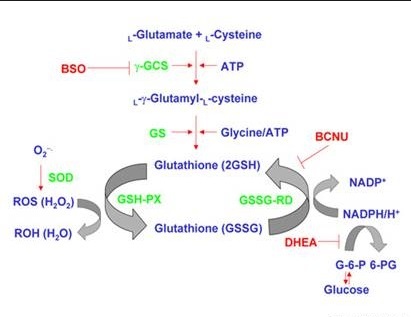 The mean level of reduced glutathione (GSH), the major intracellular antioxidant and mechanism for detoxification, was significantly decreased in the autistic children. (Metabolic Imbalance Associated with Methylation Dysregulation and Oxidative Damage in Children with Autism, 2012). The significant reductions in plasma cystathionine and cysteine concentrations observed in the autistic children were consistent with a decrease in CBS-mediated transsulfuration, associated with the low mean plasma cysteine concentration was a significant decrease in tGSH concentrations. GSSG was increased almost twofold, and tGSH:GSSG was reduced by 70%. Within the methionine cycle, significant decreases in plasma concentrations of methionine, SAM, and homocysteine were associated with significant increases in adenosine and SAH. The data may be best explained by oxidative inactivation of methionine synthase in combination with a decrease in SAH hydrolase activity secondary to the increase in adenosine. A combined enzyme deficit would also be consistent with the observed decrease in SAM and increase in SAH concentrations. The functional consequence of an increase in SAH is product inhibition of most cellular methyltransferases. Low methionine and SAM concentrations in combination with increased SAH and adenosine concentrations were shown previously to be associated with reduced cellular methylation capacity. (Metabolic biomarkers of increased oxidative stress and impaired methylation capacity in children with autism, 2004). Because DNA and histone methyltransferase reactions involve the transfer of a methyl group from SAM, epigenetics is integrally linked to transmethylation metabolism and methyl donor availability. 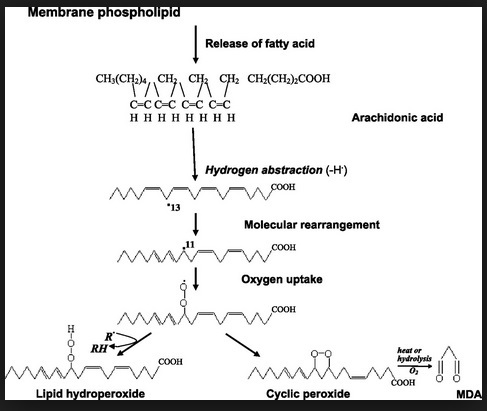 Lipid peroxidation is a chain reaction between polyunsaturated fatty acids and ROS, and it produces lipid peroxides and hydrocarbon polymers that are both highly toxic to the cell. Malonyldialdehyde (MDA) is an end product of peroxidation of polyunsaturated fatty acids and related esters, and is, therefore, used as a marker of lipid peroxidation. Ceruloplasmin (a copper-transporting protein) and transferrin (an iron-transporting protein) are major antioxidant proteins that are synthesized in several tissues, including brain. Ceruloplasmin inhibits the peroxidation of membrane lipids catalyzed by metal ions, such as iron and copper. It also acts as ferroxidase and superoxide dismutase, and it protects polyunsaturated fatty acids in red blood cell membranes from active oxygen radicals. Increased levels of LPO together with decreased levels of serum ceruloplasmin and transferrin suggest that children with autism are under increased oxidative stress, likely due to abnormal metabolism of pro-oxidant metal ions and/or decreased antioxidant proteins. 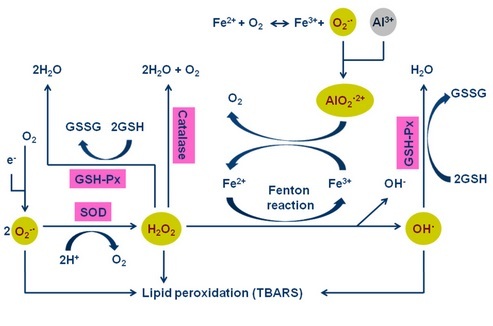 Oxidative stress-induced production of lipid peroxides and their by-products is known to lead to the loss of membrane functions and integrity. It is observed that the fluidity of the erythrocyte membrane of children with autism is lower than that of unaffected siblings. (Oxidative stress in Autism, 2006). The density of lipofuscin, a matrix of oxidized lipid and cross-linked protein that is formed as a result of oxidative injury in tissues, was observed to be higher in cortical brain areas concerned with social behavior and communication in autism. (Role of NAD+, Oxidative Stress, and Tryptophan Metabolism in Autism Spectrum Disorders and Oxidative stress in Autism, 2013). Erythrocyte thiobarbituric acid reactive substances, urinary isoprostane and hexanoyl-lysine adduct levels (oxidative stress markers) were elevated in Autism, thus confirming the occurrence of an imbalance of the redox status of Autism, whilst other oxidative stress markers or associated parameters (urinary 8-oxo-dG, plasma radical absorbance capacity and carbonyl groups, erythrocyte superoxide dismutase and catalase activities) were unchanged. A very significant reduction of Na+/K+- ATPase activity, a reduction of erythrocyte membrane fluidity and alteration in erythrocyte fatty acid membrane profile were found in Autistic children. (Oxidative Stress and Erythrocyte Membrane Alterations in Children with Autism: Correlation with Clinical Features, 2013). Reactive oxygen and nitrogen species are generated endogenously during oxidative metabolism and energy production by mitochondria in the body. While oxidative phosphorylation in the mitochondria generates superoxide anion, enzymatic oxidation of biogenic amines by MAO in mitochondrial outer membrane produces H2O2. Several mitochondrial respiratory chain disorders have been associated with autism. ETC (electron trsporting chain) complexes (1, 2, 3, 4, and 5) is decreased in the cerebellum as well as frontal and temporal regions of the brain in children with autism, leading to abnormal energy metabolism and increased vulnerability to oxidative stress. Autism is associated with a deficiency in complexes 3 and 4 of the mitochondrial respiratory chain, leading to an elevated lactate-to-pyruvate ratio. (Role of NAD+, Oxidative Stress, and Tryptophan Metabolism in Autism Spectrum Disorders and Oxidative stress in Autism, 2013). 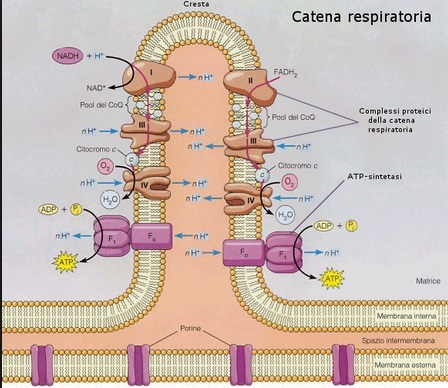 Hyperlactacidemia and an increased lactate/pyruvate ratio may result from several inherited metabolic defects of gluconeogenesis, pyruvate oxidation, the Krebs cycle, or the respiratory chain. Plasma pyruvate and lactate-to-pyruvate ratios suggest the presence of a pyruvate dehydrogenase complex (PDHC) deficiency, as previously reported. PDHC deficiency leads to in adequate removal of pyruvate and lactate, resulting in insufficient energy production. 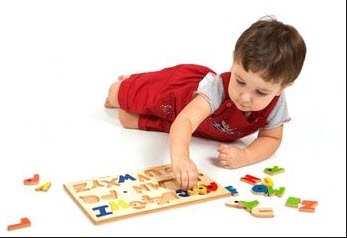 Oxidative modifications and consequent inhibition of PDHC activity is consistent with the increased rate of hydrogen peroxide formation and reduced complex V activity observed in children with autism given the increased vulnerability of this complex to oxidative and nitrative stress. This more oxidized cytosolic redox state in autism may favor anaerobic glycolysis over oxidative phosphorylation as a source of adenosine-5′-triphosphate (ATP). Genetic factors may also contribute in modulating the threshold for vulnerability to oxidative stress in autism. Recently, glyoxalase 1 and glutathione reductase 1 have been reported to regulate anxiety-like behavior in mice. Additionally, a functional polymorphism in the monoamine oxidase A promoter region has been reported to be associated with the severity of autism. All these enzymes are involved in oxidative stress. The multi-subunit NADH-ubiquinone oxidoreductase (complex I) is the first enzyme complex in the mitochondrial electron transport chain (ETC). The iron–sulfur protein fraction of complex 1 is made up of seven subunits, including NADH-ubiquinone oxidoreductase 1 alpha sub complex 5. Several double-blind, placebo-controlled therapeutic trials of the use of potent antioxidants such as Vitamin C, zinc, reduced glutathione, fish oil (rich in EPA), melatonin and Vitamin B6 in combination with magnesium in autism are ongoing. In double-blind, placebo-controlled clinical trials, treatment with high dose Vitamin C or combined Vitamin B6 and magnesium, improved the behavior of individuals with autism. Additionally, melatonin has been reported to be useful in the treatment of sleep disorders in autism. The targeted nutritional intervention trial in a subset of the autistic children was specifically designed to increase methionine concentrations. Betaine homocysteine methyltransferase provides a folate–vitamin B-12–independent pathway in the liver and kidney to remethylate homocysteine to methionine. Supplemental betaine (trimethylglycine) has been shown to up-regulate betaine homocysteine methyltransferase expression and activity to increase methionine synthesis. The intervention with betaine and folinic acid was successful in bringing all the metabolites within the methionine cycle into the normal range and simultaneously improving significantly the metabolites in the transsulfuration pathway. The addition of injectible methylcobalamin to the protocol was based on empirical observations of clinical improvement in speech and cognition and the possibility that it might enhance methionine synthase activity under conditions of oxidative stress by replacing oxidized inactive coenzyme B-12 [cob(II)alamin] or by posttranslational up-regulation of methionine synthase, or both. Nonetheless, the ability to correct the metabolic imbalance with targeted nutritional intervention implies that certain aspects of autism may be treatable. (Metabolic biomarkers of increased oxidative stress and impaired methylation capacity in children with autism, 2004). Extensive evidence suggests increased oxidative stress in autism with likely contributions from environment, genetic and immunological factors. Increased oxidative stress in autism may be due to increased production of endogenous pro-oxidants (such as NO, xanthine oxidase) or environmental pro-oxidants, or deficiencies of antioxidants (ceruloplasmin, transferrin, SOD, GPx, catalase, reduced glutathione), or both. These abnormalities might contribute to behavioral abnormalities, sleep disorder, and gastrointestinal disturbances in autism. Preliminary results of some of clinical trials have suggested improved behavior in individuals with autism who receive antioxidant therapy. (Oxidative stress in Autism, 2006). Methylenetetrahydrofolate reductase is the rate-limiting enzyme in the methyl cycle, and it is encoded by the MTHFR gene. 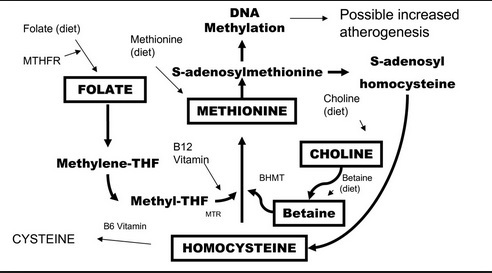 A less active MTHFR enzime causes Hyperhomocysteinemia. Moderately elevated total homocysteine (tHcy) levels have been reported in patients with overt hypothyroidism. (Plasma total homocysteine levels in hyperthyroid and hypothyroid patients, 1998). There were a significant positively correlation in hypothyroid patients between tHcy with TSH levels, tHcy was significantly related to TSH, creatinine and age and negatively related to fT4 and no relations with fT3 and cholesterol. Increased tHcy levels might be the result of two mechanisms either increased tHcy formation or decreased renal tHcy clearance due to direct effect of thyroid hormones on the tHcy metabolism in the liver and clearance in the kidney. 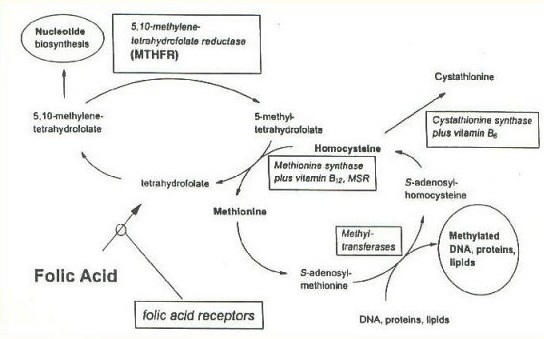 The former may be explained as thyroid hormone deficiency decreases hepatic levels of enzymes involved in the remethylation pathway of tHcy to methionine, methylenetetrahydrofolate reductase (MTHFR). Experimental studies have also indicated that MTHFR was decreased in hypothyroidismand increased in hyperthyroidism. (Folate-mediated incorporation of ring-2-carbon of histidine into nucleic acids: influence of thyroid hormone). Plasma tHcy, creatinine levels were significantly higher, and serum CysC levels, and creatinine clearance values were lower in hypothyroid patients than in control subjects. Folate levels were lower in hypothyroidic group compared to the control group. Positive correlation was noted between tHcy and creatinine levels in hypothyroid patients; however, an inverse correlation was found between tHcy and folate levels in hypothyroid patients. The folate response could be related to direct effect of thyroid hormones on folate-metabolizing enzymes, including methylenetetrahydrofolate reductase. Folate status has been established as a major determinant of tHcy level. However, the changes in vitamin levels are minor and show only weak, nonsignificant, correlations with tHcy. (Plasma Total Homocysteine Levels during Short-Term Iatrogenic Hypothyroidism, 1999). Plasma total homocysteine (tHcy) is an independent risk factor for cardiovascular disease and accelerated atherosclerosis. Cardiovascular morbidity is increased in hypothyroid patients. Relationship between total homocysteine, total cholesterol and creatinine levels in overt hypothyroid patients, 2013. Impact of renal function or folate status on altered plasma homocysteine levels in hypothyroidism, 2006. Homocysteine, folate and cobalamin levels in hypothyroid women before and after treatment, 2007.